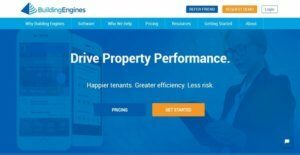 Building Engines is an easy-to-use and easy-to-deploy property management platform that has been helping innovative and leading companies and businesses increase their efficiency and deliver an outstanding customer service to tenants. The platform is created based on reliable information collected from building management and maintenance professionals and implements the best practices when it comes to property and tenant management. With Building Engines; property owners who are managing commercial offices, facilities, or real estate, retail or industrial properties will be able to discover and unlock the value of their facilities and assets so they can improve customer experience and their operations. The platform brings all the processes and people involved in building or portfolio operations in a unified platform. Thus, it automatically captures information associated with tenant service management, asset and equipment maintenance, operational risk management, and communications; and automates all tasks and activities related to those aspects. The property management platform also has a mobile app that connects users to critical data and building information wherever they are and allows them to manage their tasks remotely from any mobile device. Building Engines is built with core modules that streamline the management of tenant services, implementation of building maintenance activities, enforcement of security measures and safety procedures, management of operational risk, and engagement with customers. One of the key features of Building Engines is found in its architecture. It is a unified cloud-based property management platform. Therefore, it integrates and unifies all data, tasks, activities in a single solution and permits property teams to easily connect to them. It organizes all the tools and information that users need in one place, helping them automate their workflows, increase efficiency, and gain valuable insights and come up with better decisions. As an example, Building Engines lets users conduct building or property inspections through their mobile phones. This enables them to collect data easily and pinpoint issues and deficiencies. When they identify deficiencies during mobile inspections, the platform allows them to generate work orders automatically based on any data or information they gathered. In addition, whenever they conduct a mobile inspection, they can connect such inspection to any equipment record they have within the platform. In case they assigned the work order to an outside vendor, the platform assists them in immediately checking whether the vendor has a valid or active Certificate of Insurance. Because Building Engines is a unified platform, users no longer need to invest in multiple and disconnected property management systems, purchase extra modules for the platform, or worry about collecting data from multiple modules and relating data between modules. Building Engines is equipped with an innovative work order management capability which is a component of its tenant service features. This capability allows users to go beyond the traditional work order management in property management and maintenance, enabling them to create a service delivery that satisfies customers and tenants. With such capability, users will be able to come up with service programs that they can configure in various ways. They can set priority levels for work orders and services and define their own response and completion target for each work order or service. This way, property teams can identify which work order or service has the highest priority and understand the processes involved with it. For instance, they can give higher priority to plumbing services than cleaning services and assign faster completion times to the former. Also, as they set service priority levels and targets, they can assign alerts to each service so that tenants, vendors, and staff are automatically notified about what they need to expect from the service. These automated alerts also enable them immediately reach out to staff or vendors when services or work orders need to be escalated or reassigned. The innovative work order management capability of Building Engines permits property managers and teams to gain insights into service delivery performance. This means they can define their own service performance standards and benchmarks while they create work orders. Because of this, they can track how the services are being performed and whether the performances are hitting the goals they set. Tenants can also give feedback on the services which makes it easy for users to measure service satisfaction and gain insights from it. The property management platform offers a mobile app called BE-Mobile. The mobile app helps users access and manage critical building information, tasks, and messages anywhere and on any mobile device, be it an Android, iPad, iPhone, or a BlackBerry device. Providing users with remote management capabilities, BE-Mobile is very useful for engineers and property managers. For instance, The mobile app lets engineers view and access equipment manuals, floor plans, schematics, and instructional videos wherever they are. As the perform work order, incident, and inspection tasks, they will be able to capture data and photos using the app as well. For property managers, BE-Mobile enables them to broadcast messages and send emergency notifications to teams, vendors, and tenants. In addition, Be-Mobile has a mobile tenant center where they can quickly access key tenant information such as work order details, Certificates of Insurance, service history, and leases. Also, the app lets them reassign tasks and approve the time cards of their employees and staff easily. Building Engines delivers reporting and analytics features that permit property owners and managers to collect data on any aspect of their operations in real time and obtain insights from it. Whether they want to get snapshots of broad operational areas, drill down into the details of performance reports, generate annual summary reports, the platform ensures that they are able to capture, communicate, and work on actionable data and intelligence related to property and tenant management. In addition, in order for them to focus on the most important data and information, the platform enables them to filter whatever data or reports they have. Thus, they can filter the data and reports based on building, portfolio, region, vendor, occupant, or personnel. It has a dashboard where property owners and managers can access visual representations of key performance indicators or KPIs for COI coverage, service delivery, and tenant satisfaction. They can also see high-level overviews of work orders, preventive maintenance tasks as well as incidents. If they want to get detailed views of the key areas of their operations, the dashboard also permits that. Additionally, Building Engines has a search grid which can be used for creating reports and lists rapidly. When this search grid pops out, users can generate custom reports and list views on the spot and print them. If you are considering Building Engines it may also be beneficial to check out other subcategories of Best Property Management Software gathered in our base of B2B software reviews. It's important to realize that virtually no service in the Property Management Software category is an ideal solution able to match all the requirements of different company types, sizes and industries. It may be a good idea to read a few Building Engines reviews first as certain solutions may excel exclusively in a really narrow group of applications or be prepared with a really specific type of industry in mind. Others may operate with an intention of being easy and intuitive and therefore lack complex features welcomed by more experienced users. You can also find solutions that cater to a wide group of users and provide a powerful feature toolbox, but this usually comes at a higher cost of such a solution. Ensure you're aware of your requirements so that you buy a software that offers exactly the elements you search for. How Much Does Building Engines Cost? Building Engines is available through an annual subscription which includes an annual subscription license fee calculated based on the type of property you’re managing, and a one-time setup and configuration fee. Please contact the vendor to get more information about Building Engines’ SMB and enterprise pricing plans, and ask for a quote. We realize that when you make a decision to buy Property Management Software it’s important not only to see how experts evaluate it in their reviews, but also to find out if the real people and companies that buy it are actually satisfied with the product. That’s why we’ve created our behavior-based Customer Satisfaction Algorithm™ that gathers customer reviews, comments and Building Engines reviews across a wide range of social media sites. The data is then presented in an easy to digest form showing how many people had positive and negative experience with Building Engines. With that information at hand you should be equipped to make an informed buying decision that you won’t regret. What are Building Engines pricing details? What integrations are available for Building Engines? If you need more information about Building Engines or you simply have a question let us know what you need and we’ll forward your request directly to the vendor.